Non-enveloped, head-tail structure. The icosahedral head is about 320 nm in diameter. The non-contractile tail is about 1800 nm in length. There is a small baseplate and a terminal fiber. Circularly permuted dsDNA genome of about 69-71 kb, containing about 92-109 genes. 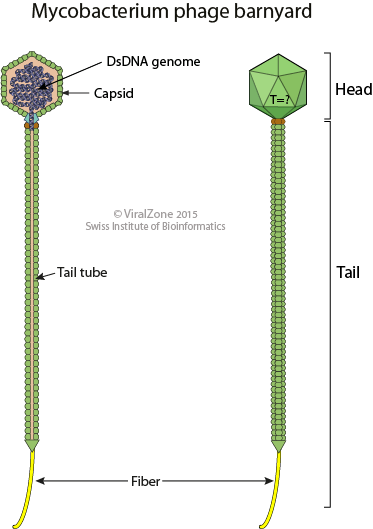 Adsorption: The phage attaches to target cell adhesion receptors through its tail fiber.